With its raised ride height, available all-wheel drive (AWD) and beefy looks, the 2016 Countryman is the crossover SUV of Minis. It offers more cargo room than a traditional Mini and has seating for five. The Countryman endears with its premium feel and athletic driving manners, but now lags rivals like the Mazda CX-3 in technology and driving aids. Having always wanted a Mini Cooper, I had very high expectations for the car. As far as performance, reliability and quality, it's been nothing more than amazing. Most of the issues are due to lifestyle. I have a hard time fitting fishing poles, hiking and camping equipment in the car. Other than the issue of space, there's only two other issues. The Bluetooth system in the car can be very irritating. Ita constantly connecting and disconnecting. Sometimes it doesn't want to work at all. The only other problem has been the A/C. It's atrocious. If it's above 80-85 degrees outside, it has a hard time keeping up. Coupled with the black, leather interior, it can get and stay plenty hot, given the temperature is in the 90's, or above. I would highly recommend a Mini Cooper. They are so much fun to drive. I have had very few problems with my mini. The handling is fantastic and it is all-wheel drive so it is wonderful in bad weather. It is much bigger on the inside than one would think and the seats are extremely comfortable. It also has paddle shifters to shift from manual to automatic very effortlessly. It also has a BMW service plan so basic maintenance is covered. The only disadvantage for me is that my dealership he's quite a distance away because many does not have a local dealer. However the one time I did have an issue and I took my car down to them they kept it for the weekend gave me a loaner car free and then drove my car back up here to me so the service is wonderful. Classic mini super sized for the us. The performance and comfort is up to mini standards. 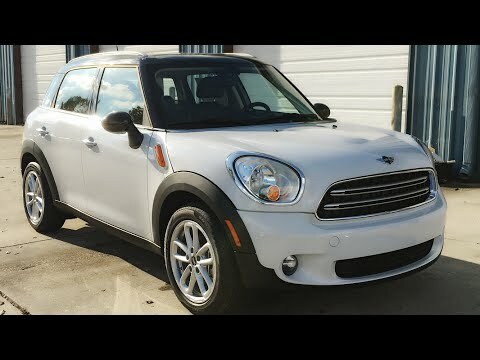 I miss having a smaller mini though as the countryman is definitely a larger vehicle. The features are also lacking. This is a BMW/mini all around problem though. The technology is dated and newer phones are issues being compatible. I have to listen to podcast and Audio books via AUX settings. It is a pain. The reliability is good if you keep on top of maintenance. Regular oil changes in minis are crucial.